South facing, two bedroom first floor apartment in Petit Châtel (1280 mtr altitude, approx. 2 km from Châtel centre) sleeps 4 adults or 2 adults 3 children. Accommodation comprises: Lounge/kitchenette, 1 twin bedroom and 1 bedroom with 2 bunk beds and pull out bed, shower room with WC, separate WC, balcony with glorious views of Châtel and across the valley. Parking space, garage for mountain bikes, and a large external cupboard (Cave) for skis as well as ample cupboard space inside the apartment. We have WiFi, English Satellite TV as well as French TV. There is a frequent free bus service to Châtel lift stations that stops right outside. The nearest lift is a few minutes bus ride away and, in good snow conditions, you can ski almost to the door - off piste! Châtel is within the Portes du Soleil giving access to over 600km of ski runs. In the summer the village is a Mecca for mountain bikers with an excellent bike park, permanent downhill runs and plenty of cross country routes, if needed I could give you the name of an English speaking guide. Location: Châtel has a good selection of bars and restaurants and a good après ski atmosphere. Our apartment block is located in a quiet position in the Petit Châtel area, just above the town centre. It is walking distance to the centre, but during winter/summer seasons, there is a restaurant and Bar in Petit Châtel along with Sports shops and News Agent/Laundrette, and central facilities are accessible via the free bus service (seasonal). Some of the bars located in the centre of Châtel offer customers the use of their complimentary bus service. A rental car is recommended, or you can arrange airport transfers with local companies (contacts can be provided). Summer: Why not just sit on our balcony taking in the superb view while having drinks or eating your meal? For the energetic, this is superb walking country with many marked walks in the area into Switzerland. Use the Ski Lifts to reach the mountain tops to simply admire the wonderful views of the Alps and Mont Blanc in the distance, then perhaps walk down. During July and August some of the ski lifts are open and there is a regular free bus service from the stop outside our apartment. Ideally located for the many mountain bike trails and the Bike Park at Pré-la-Joux. The Pre le Joux lift usually opens in mid June to provide access to Morzine, Avoriaz and Le Gets for mountain bikers and walkers. Other activities include: fishing, climbing, horse riding, paragliding, swimming in the aqua centre (due to open Summer 2014), tennis, Luge, Devil Carts and junior bike park. There are some excellent mineral spars a short drive away, where you can relax after a days walking or skiing. My wife and I are retired and live in Horsham, West Sussex, UK. We rent out our apartment in Châtel when we, or our family, are not using it. We think Châtel is one of the most beautiful villages in the French Alps, unspoilt, no ugly buildings, fabulous location, and is very well maintained by the local council, thereby retaining it's alpine charm. It is also superbly located for touring in the French Alps, western Switzerland and northern Italy. In winter the Portes du Soleil is probably one of the best ski locations in Europe, with so many runs for all abilities. We always try to find new runs that we haven't skied before. In summer there is nothing better than sitting in the warm sunshine on the balcony eating breakfast, lunch or dinner, taking in the fabulous view over Chatel and the Abondance valley. New for 2014/15 Winter Season: 2 new chair lifts and ski run to link Super Chatel and Linga ski areas to avoid the need to use the ski bus. The property is maintained to a very high standard. Money earned from renting is used to update furnishings regularly, regular replacement of quits, mattress covers and pillows, as well as contributing towards the annual running costs. We now employ a local property manager who: - regularly inspects the apartment to ensure the high standard is maintained - can switch heating on before your arrival - provides a local point of contact - as well as linen and cleaning services, if required. Summer only for storage of mountain bikes. Linen not included: you will need to take single bed sheets, single bed douvet covers, pillow slips, towels and tea towels. Apartment must be cleaned when you leave using the cleaning equipment provided. WiFi & Satellite TV available, so you can keep up with events back home, watch your favorite soap or find out the sports results. Linen can be provided on request at additional charge, cleaning can be arranged upon departure (£60). at Les Linderets. A must for anyone with children. We never felt the need to eat out anywhere. Self catered & just sat on the balcony each evening with a glass of wine watching the sun go down. WONDERFUL!!!! A very comfortable apartment containing all we needed for a relaxing holiday. Terrific views and a nice quiet environment for a relaxing holiday. The Wi-Fi and satellite tv were great for keeping in touch back home and for those of us who struggle to comprehend much of the French language, the English tv probs we're a nice way to wind down in an evening. Another super holiday in Chatel ! Apartment was warm and comfortable, had everything we needed and in an excellent location, which was easy to find. Perfect to have the bus stop just outside. Fantastic views from the balcony. Information from the owners was spot on. Far enough outside of town centre for peace and quite, yet within easy reach of all amenities. Fantastic apartment and will request again with no hesitation. Thank you, we will be pleased to welcome you back. Nice Comfy and compact ideal for our stay ! Had a fantastic holiday in this apartment. It was clean, modern, warm and everything worked. Wifi was great - worked in all rooms and never 'dropped out' - a bonus as in my experience wifi in Chatel is not always reliable. Having been to Chatel many times we knew the location of the apartment and so were prepared for the walk back in the evening - its about 25 mins. The bus stops outside and runs regularly so no need to walk during the day. We also discovered this time that there is an evening service which runs back up to Petit Chatel until 11.30 on Wednesday and Friday which was useful. The apartment is great, 2 bedrooms and a living area which has plenty of space for 4 to relax in. The kitchen area is fully equipped - plenty of glasses, crockery and cutlery The balcony gives a fantastic view of the whole town and valley - we sat outside with blankets and hot chocolate on a couple of evenings. We were lucky this year as they have had great snow in Chatel (unlike the previous 2 yeas) - we did see people skiing back to the road outside the apartment but didn't manage to work out the route ourselves. 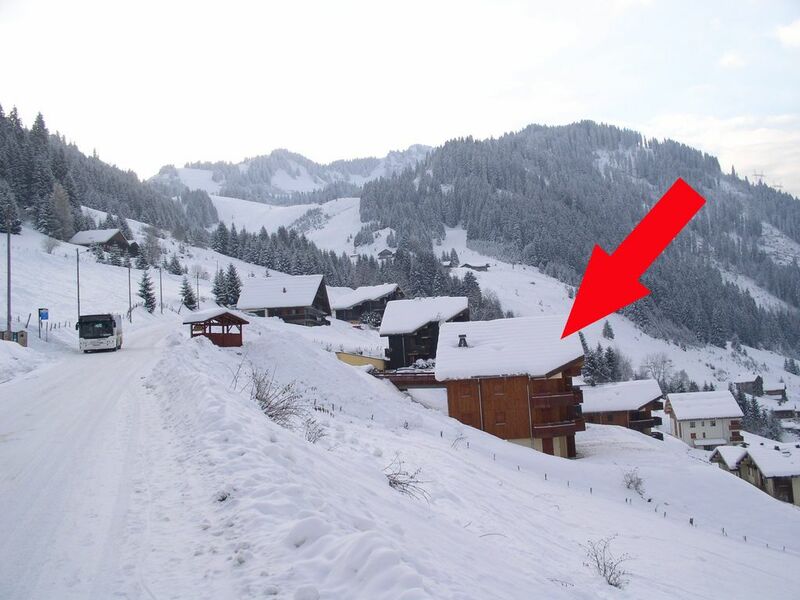 Chatel is a beautiful village and I would highly recommend this apartment. Châtel is the most Swiss-like of all the French resorts, whose combination of tradition and modernism welcomes you in an exceptional setting. Situated at the end of the picturesque and rural Abondance valley and just a stone’s throw from the Swiss border between Lake Geneva and the Mont Blanc, Châtel is a charming haut-savoyard village. It is easily accessible from Geneva airport by motorway (1 hour 30 mins) or by train to Aigle then taxi. Nearby places to visit include: Evian, Chamonix, Annecy, Verbier, Montreux. Châtel’s geographical location, in the most northern part of the French Alps, combined with the effects of Lake Geneva, produce a microclimate which ensures optimal snowfall throughout the winter. Nevertheless, to contend with the weather’s unpredictable nature and to guarantee snow, Châtel has over 175 snow guns. Located in the Portes du Soleil, claimed to be the world’s largest linked ski area in the world, you'll never run out of Piste. The nearest chairlift is the Barbossine lift (open for the main winter season) in Petit Châtel, approx. 1km from the apartment, where you can ski to Super Châtel, and Switzerland with links to the Portes du Soleil. There is a frequent free ski bus which stops right outside the apartment (also operates in summer). As we are near the start of the bus route, there is never a problem getting on the bus. The Barbossine lift is at the next stop on the bus route. For Super Châtel and Linga lifts, just stay on the bus, for Pre le Joux change at the Châtel church (some buses go direct to Pre le Joux without the need to change). The Pre le Joux lifts generally starts running from mid-December to the last week-end of April giving access to Avoriaz (subject to snow conditions). All other ski lifts for the Portes du Soleil generally open from Christmas to Easter. Discounts for Ski equipment rental are available via the INTERSPORT web site, where you can arrange collection from the Intersport shop in Petit Châtel. Price includes: electricity, water charges, cleaning of communal areas only, Wifi, and snow clearance in parking area (winter). As is the tradition in France, guests must take their own linen and clean the apartment before departure - cleaning materials provided. We can put you in contact with a linen supplier (price approx. 20 Euros per person plus 20 Euros delivery/collection) or arrange for cleaning on your departure at £60 (70 Euros). Guests must vacate the apartment by 10 a.m. on departure day, except by prior arrangement.